Middle-age (at least) men on line for Star Wars know from aching nostalgia. They'll freeze on sidewalks to reclaim 1977 just as So Dear To My Heart's narrator longs to be back in boyhood where "fishhooks, jackknives, and candy" were an only concern. Walt Disney grew up in this kind of world. He'd spend a lifetime trying to duplicate it. 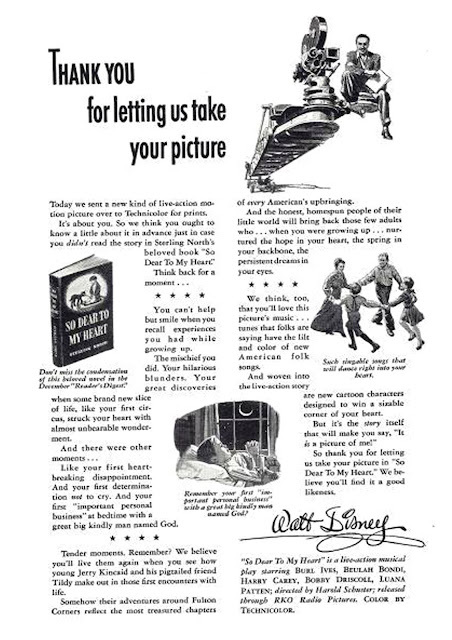 Many of Walt's generation grew up rural. For them, life's sole purity was had on a farm. 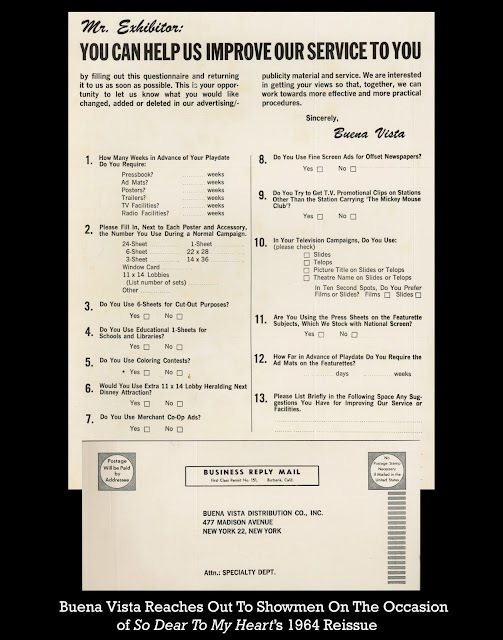 Most would be yanked from bucolia to WWI trenches or Depression worry, then face another war in the 40's. Nothing for them could seem so gone as lost innocence that was dawn of a 20th century. So Dear To My Heart is as perfect a title as could applied to content like this. Maybe Disney should have used it again this month: Star Wars: So Dear To My Heart, instead of The Force Awakens. Every generation's nostalgia is the next generation's quaint, or laughable. Old time collectors who'd first mentor me would talk longingly of Fred Thomson or Tom Mix and I'd think how much more sophisticated I was for growing up on James Bond and Hammer films. More-so objects of my condescension was a next group that sat at altars of Roy, Gene, or Lash. Movie memories I had gathered surely had more heft and lasting value than these. Immaturity can bring you to such wrong conclusion. Most of those raised in the real good old days would be gone before I'd wake up to how fortunate they'd been. So Dear To My Heart coming out in 1948-49 might have been too late for capturing its ideal audience (domestic rentals were $2.2 million as opposed to Song Of The South's $3.5 million of two years before). So Dear's story being set in 1903 placed it far back of most ticket-buyers in '49, fewer of whom had grown up on farms so as to know joy of cow-fresh milk or new-born livestock. There'd be further remove by the time So Dear To My Heart had its first and only reissue in 1964. To by-then increased number of city-bred viewers, rural backdrop was more hardship and place to get away from than vanished utopia. These farm folk didn't even have television, after all. Not that Disney had ignored the theme since 1948. 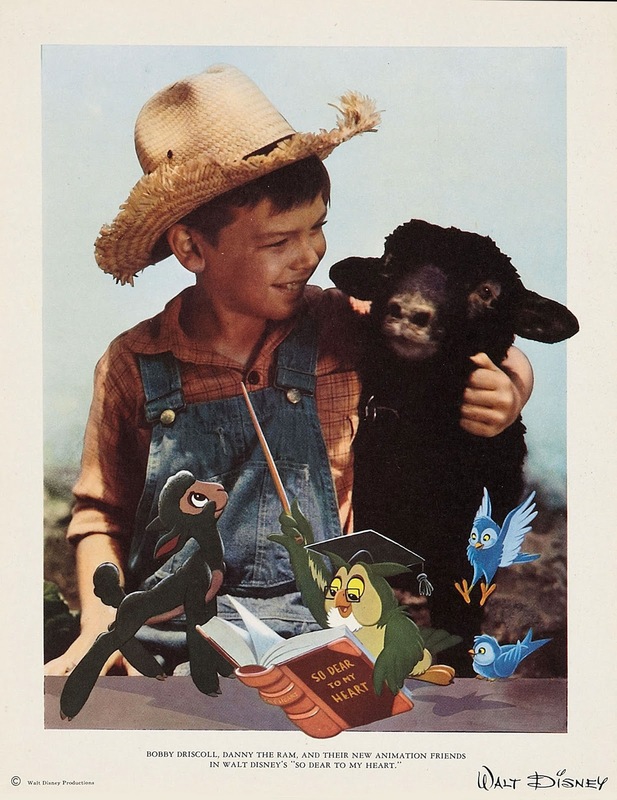 There had been Old Yeller and its more dramatic telling of a boy's attachment to his pet. 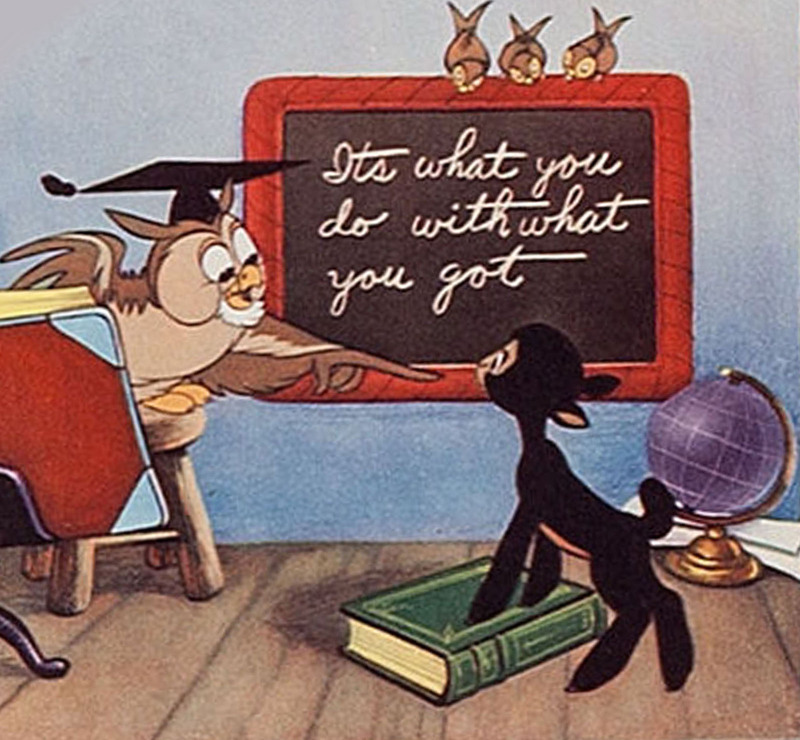 So Dear's animal focus was a black sheep getting early start on household wreckage that would later occupy Great Danes, darn cats, and way-out seals of Disney 60's menagerie. You could, in fact, credit So Dear To My Heart with giving that formula birth. Slapstick in Disney live action saw first flowering here. Maurice Rapf, who co-wrote So Dear To My Heart, recalled in his 1999 memoir (Back Lot, from Scarecrow Press) that 20's comedies were often shown during lunch hour to animators and story men, there being "much to learn" from Mack Sennett, Chaplin, Keaton, Lloyd, and Charley Chase. Sight humor would temper So Dear's lament for a past beyond reach. There would also be life lessons spoon-fed by animated critters in short segments throughout, these a hook perhaps over-emphasized by Disney-RKO sales. Not a few ticket-buyers figured cartooning to be bulk of footage, where in fact opposite was true: this time live action would dominate. So Dear To My Heart first went before cameras in 1946, had scenes added through early 1947, Disney spending much of 1948 at further delay and tinkering. So Dear was a very personal project and a closest Walt came to faithful recreation of boyhood he'd known. For having made scant impression when new, the film saw next service on Disneyland, the ABC-TV series (in 1954). Considering WD's affection for So Dear To My Heart, it would be most interesting to see/hear his intro from that broadcast. There is currently an out-of-print and high-priced DVD, but So Dear To My Heart streams at Amazon and elsewhere in HD. Leonard Maltin also hosted it recently as part of his ongoing Disney series on TCM. I grew up with this movie on VHS, and it was and still is one of my favorite Disney films. I never realized until seeing it discussed among movie bloggers recently that it was considered more "obscure" Disney! Love all those still photos from it in your blog header. Developed and co-written by my college film professor and mentor Maurice Rapf, who also developed and co-wrote "Song of the South" and "Cinderella" before the black list chased him out of Hollywood, to Europe and ultimately to academia. Walt didn't didn't chase Maury out. Maury was the son of MGM producer and mucky-muck Harry Rapf and lifelong pal of Bud Schulberg. Anyway, it DOES include Walt's TV intro. It's actually very abbreviated: A single setup of Walt sitting behind a desk, holding a copy of the book (a tie-in edition). He hurriely whips through a speech about how, just fifty years ago, America was mostly rural towns and our parents and grandparents hand down stories of that age. It looks like he's either late for something or he's afraid of the intro running overtime. The disc also offers an image gallery and a few "fun facts", plus a coupld of train-centric cartoon shorts. Considering most of the "exclusives" are bare bones, suspect they'd gathered some stuff for a Vault edition before that line was ended. 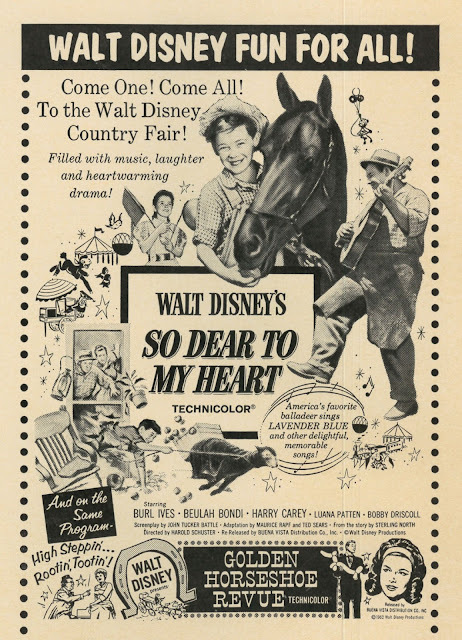 "So Dear to My Heart" did figure prominently in the early plans for Disneyland, with "Grandma Kinkaid's Farm" being part of the village originally envisioned. The original train station in Frontierland was a clone of the set built for the movie. The actual structure was somehow hauled to Ward Kimball's property to accompany Kimball's full-size steam train. Disney tried to buy it back from Kimball, but had to settle for sending guys out to take measurements for new plans. The recent PBS documentary on Disney pointed out the irony of Walt's lifelong attempt to recapture his idyllic rural past, since he mostly grew up in urban areas, spending much of his youth in Chicago. 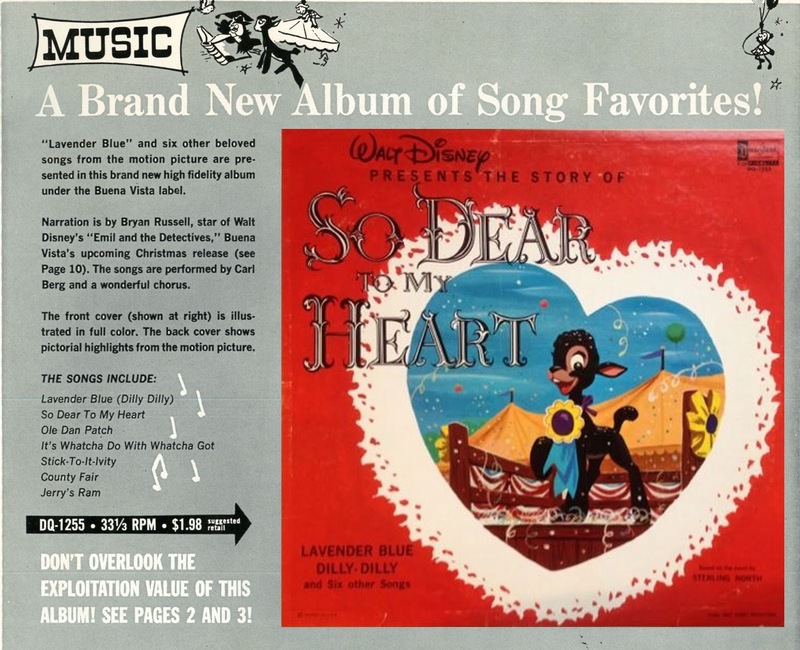 John, glad to see your entry on "So Dear To My Heart". I saw this as a kid in second grade! I cannot remember why exactly, perhaps it was considered a 'treat' for us kiddies, but our teacher acquired a 16mm print (might've been at one of the holidays) and showed it in our classroom. I couldn't really remember it accurately from that first exposure ca. 1959, but because reacquainted with it via a laser disc issued in the '90s, I think. I assume this is still in my possession although those pricey laser discs eventually all migrated to cardboard boxes stored in my basement! I am able to appreciate this movie through layers of frosting and marzipan, because it's so sincere in intent. 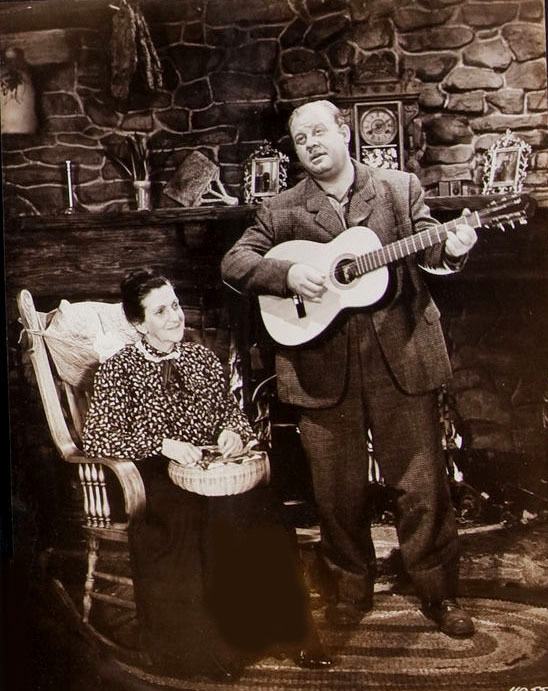 I always liked Burl Ives singing those songs in it. I also like the title tune, which was written (at least the lyrics) by Bob Wells, I think ("The Christmas Song", i.e., "Chestnuts roasting on an open fire...") I think it's a terrific song and imbued with a kind of gentle, tender fondness for memories of the song-narrator's childhood, a good kickoff for the movie. The animation....well, it's a bold notion, whether it works or not. 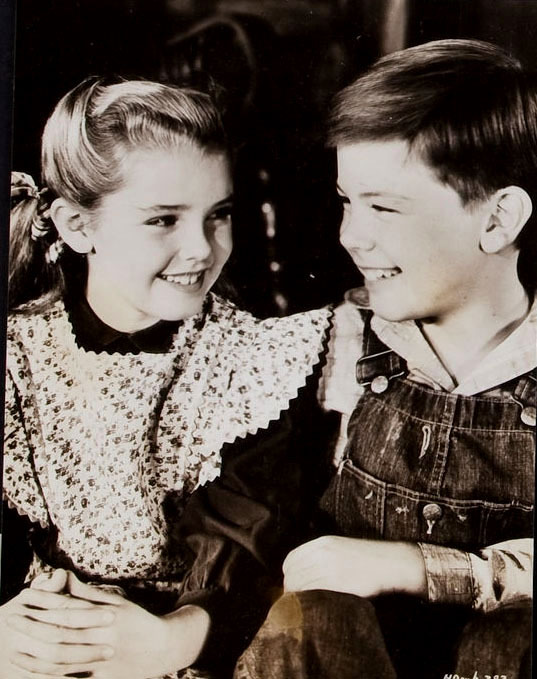 The movie of course has the same almost unbearable sense of sadness from watching little Bobby Driscoll. Disney has been quoted as having made fun of Driscoll's acting, but I can't believe he said it. If he did, I must say I don't agree with Disney on this one. I thought Driscoll was extremely believable and extremely sympathetic, at least as a little boy. We all know, I suppose, the terrible end of his life, and it just lends such a poignant feeling to watching him as a kid. I know that Disney was fond of the fiction of Sterling North (a great name!) I think he did one for his TV series called "Rascal", about a family pet who's a squirrel (? ), and I'm not certain, but wasn't "Old Yeller" a North book? That's one that tore our little hearts out back in 1959! Oh, brother. Anyway, thanks for talking about "So Dear To My Heart"! I will have to see if I can access this in HD on Amazon! I'd really enjoy seeing it again, I think, warts and all. OLD YELLER was by Fred Gipson, and RASCAL was a raccoon. I had to project RASCAL in my local theatre in 1969. It had to be one of Disney's biggest bombs. I think it was Fred Gipson who was the author of "Old Yeller" and "Savage Sam." I watched this a few weeks ago when it was on TCM. The next day I came here to see what you had to say and was disappointed not to find it. Turned out to be perfect timing a week later. Thanks for the in depth write up! Disney's Golden Oak Ranch is still there in Newhall and not going anywhere. In fact, they bought the ranch next door, the Jaregui(?) Ranch which had been used for some B westerns, to expand their facilities. My brother and I were given a tour of the Golden Oak a few years ago. It was unbelievable to actually stand in the 'Triple R' corral. Recently the ranch has been seen in 'Sons of Anarchy' and 'The Office' (Dwight's beet farm). It was kind of funny; the very nice lady was showing us the sites of new productions while I was asking about 'Old Yeller' and 'The Swamp Fox'. I read recently that Disney has gotten approval to build a large sound stage on the property. @tbonemankini: Why would they want (or need) to?